B i r d m a n T r i b e: El Nino? So there are some reports claiming that we are heading for another El Nino year. Which sounds about right considering that I don't remember a solid Winter of surf since '04 which is when the above pics were snapped. That particular Winter my friends and I had just returned from a Baja trip and everybody was telling us how much it had rained while we were gone. We heard that it rained for like five days straight in LA which I don't think I've ever heard of. I heard reports of huge tornado like water spouts off of Oxnard and Santa Monica and I believe that it was the same winter when La Conchita suffered a tragic mudslide. 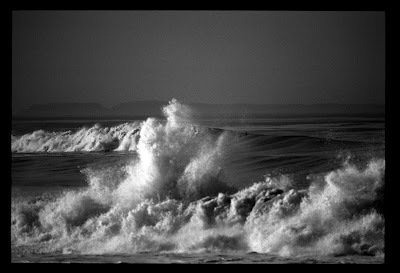 We didn't get much swell down in Baja from those intense storms up North, but when we got home the surf was pumping for twelve days straight. These shots were taken in the beginning of that run of swell and as you can see the rain had produced some huge sandbars, people were actually boating out to the edge of the one in the pics. 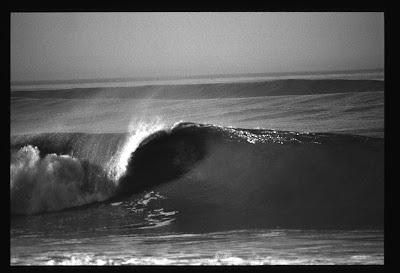 There was day after day of big offshore barrels, long lined up point swells, and just solid Winter surf. There has not been a Winter like that one since, so we'll see if the talk of El Nino is for real, I already heard one report that said it could be a very mild El Nino, so I'm not going to get all excited just yet. It sure would be nice though, to pull out the 6'8" and get a few heaving beachbreak tubes, or maybe even grab the 7'2" a couple of times and paddle into a few mackas.